Truck drivers spend most of their time on the open road, away from friends and family. That’s one of the main reasons why they often utilize a variety of gadgets in their day-to-day lives. 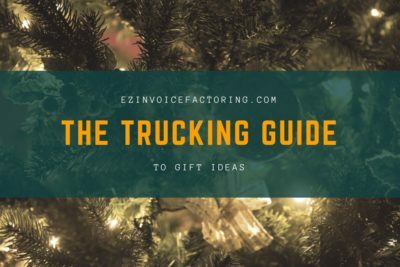 If you’re looking for a perfect gift for a truck driver you know, or are a trucker looking for the latest technology for yourself, look no further. These are the must-have electronics for truck drivers. The number one must-have gadget for truck drivers is an electronic logging device, also known as an ELD. Drivers must have an ELD on board their truck to track when they drive and how far they go. Company trucks may already come with an electronic logging device on board, but owner-operators may have to purchase their own. There are a variety of ELDs to choose from, each with their own benefits and downfalls. Preferences aside, the logging device has to be government compliant. This Garmin eLog is a great ELD for beginners and experts alike! One of the most popular cab accessories for truck drivers is the CB Radio. These radios are basically a necessity for those who choose truck driving as a profession. Each U.S. FCC regulated Citizens Band Radio allows operators to access 40 different CB-only radio channels that can be used to transmit messages over long distances, making it a must-have electronic device for truckers. A basic model, like this one, will give you access to all of the standardized features the CB has to offer. For a bit more money, a higher end CB Radio can be purchased. Models like this one have a higher scanning ability, meaning it’ll most likely pick up more than the 40 regulated channels. The sound will be better and truckers will also be able to access certain area-specific weather bands and alerts. Behind the ELD, the smartphone is one of the best gadgets for truck drivers to have in their cab. Whether the phone is Apple, Android or anything in-between, it comes in handy for communication, navigation and entertainment – If you have unlimited data, what you can do on a smartphone is limitless. If you don’t have a smartphone, or do and just prefer a larger screen, get a laptop computer. This must-have electronic lets truck drivers access nearly anything they could ever want on the road. Bored? Watch a movie or TV series via a streaming service or DVD. Missing home? Video call your family. Need a product but can’t find it in-store? Buy it on Amazon and have it delivered to the nearest Amazon pickup station. Laptops aren’t just for play, either. Use Google Docs to make a budget and log expenses or secure the cash needed to purchase gas by applying for transportation factoring online. One of the most popular must-have gadgets for truck drivers is the Bluetooth headset. When someone is on the road as much as a truck driver is, they need a way to take calls and operate their phones without using their hands. Multiple laws in several states also prohibit drivers from using their cell phones while driving, so having a Bluetooth headset also allows truckers to ensure they are obeying the law regardless of where they are. When it comes to purchasing a Bluetooth headset, look at its features. Some have a long battery life but have horrible audio quality and vice versa. If you’re looking to play it safe, purchase a headset rated as one of the best Bluetooth headsets for truck drivers. One of the best gadgets for truck drivers to have, hands down, is a reliable dashboard camera. Regardless if a driver is an owner-operator or is working with a fleet, having a dash cam can be a lifesaver when it comes to documenting accidents or driving time. Any model will do, but make sure whichever one you purchase has HD recording and features a wide-angle lens, like this one. It’s no secret that truck drivers have a hard time getting enough activity per day due to their long hours on the job. That’s why another must-have gadget is a fitness tracker. Link the fitness tracker to a smartphone and start monitoring sleep and movement. Most fitness trackers allow their users to set their own goals, so if a truck driver wants to walk two miles every day, their fitness band will remind them of the goal and encourage them to reach it. Most fitness trackers also allow their users to connect with other users via their app, meaning a trucker can find others in the same field and challenge them to reach their fitness goals as well. Don’t know where to start when it comes to purchasing fitness trackers? Start with the FitBit! Not looking to spend your time aimlessly scrolling the internet? Consider adding an e-reader to your electronics collection. An e-reader is a must-have gadget for any trucker that enjoys books. The book selection at most gas stations is subpar and it’s difficult trying to maneuver a semi-truck into a library parking lot. With e-readers, truckers can get any book they want from any library they’re close to using the Libby app – all that’s needed is a library card. If you’re someone that prefers buying books, you can do that with an e-reader as well. This Amazon Kindle offers books for purchase directly through the Amazon app. In addition, there are thousands of free e-books available for download. Barnes and Noble also has an e-reader called the Nook that has the same options. Both the Nook and the Kindle are available in paperwhite versions and tablet versions. The paperwhite e-readers act like a book. They’re small and only used for reading or basic games like sudoku. The tablet versions act more like a tablet would – you can read, play games via downloadable apps or browse the internet. As a trucker, the most important thing in the world is the keys to your semi. However, keys are small and tend to get lost easily. Make life easier by purchasing an item tracker. You’ll never lose your keys again. Once activated via a smartphone app, this must-have electronic device gets hooked onto a set of keys, stuck in a wallet or placed on, in or near any item that gets misplaced often. That’s it! Then, whenever the said item the tracker is attached to is lost, it can easily be located using a smartphone. Just press a button and the item tracker will ring loudly until it’s found! The item tracker can also monitor your phone. Misplace it and the item tracker will make the phone ring loudly, even if it’s on silent. A great cab accessory for truck drives is the wireless smartphone charger. If you want your phone to have juice, but don’t want to have to deal with wires, pick one of these up. It’ll keep phones devices fully charged regardless of if it’s an Android or an iPhone due to new technology, making it a necessity for truck drivers who use their smartphones for everything from navigation to entertainment. Truck drivers often use their phones and electronics at truck stops where there is free WIFI. However, sometimes the WIFI doesn’t extend to where the truckers are parked. If you want to make the WIFI reach your cab, consider purchasing a WIFI booster. This must-have device will pull WIFI signal close by and amplify it. If you’d rather have WIFI wherever you go, consider purchasing a WIFI hotspot from either your cell phone provider or via a pay-as-you-go service. It will cut down on your phone bill and let other electronics, like laptops and dash cams, to connect to the internet as well. Need cash to pay for gas on the road? Start factoring with us today!